COPPELIA is one of the most often performed ballets in history, it’s a vital part of the ballet tradition. People know the story very well, for example from Offenbach’s opera, so the audience feels familiar with the tale they like. But I don’t aim to create something absolutely different from the tradition. I just follow the idea which grows from the original work, from the music, trying to answer its call. I listen to my personal instincts with a nowaday’s audience in mind. The music is very lively, delightful, beautifully composed by Léo Delibes. His sense of the moment in a performance is quite stunning, the suite made in numbers serves the tension of the stage actions. It’s entertaining. There are many shifts in the mood, we have beautiful melodies, and nevertheless quite careful musical descriptions of each character and situation. To me, sensuality and even irony shine in his score. I find it very inspiring. There is also a Polish trace in the music… It’s called “Thème Slave”. I would say it’s very Coppélian. My COPPELIA takes place in Poland (it was often changed into France by the directors). According to this idea I wanted to have some folklore references in the stage design. With Fabrice Serafino, the set and costume designer, I decided to use traditional regional Polish folklore ornaments and the motif of lace. But the colours are minimalistic. The brilliant mood of Delibes’ music should be reflected in the sets. So everything will be silver in my version, the stage, the costumes. It is combined with a lot of skin colour. The imagination of the Italian choreographer and his ideas for the dance seem to have no end. They are brilliant, sophisticated, wittily commenting on reality and even twisting it gently, always in moderation. “Coppélia” in the interpretation of Giorgio Madia is not a purely classical ballet, even though performed on point shoes (in fact the dance is dominated by soft ballet shoes), but will appeal to those who are looking not only for great emotion and drama in a ballet performance, the story is less bombastic, it’s unpretentious and full of grace. The well-known story comes with a clear message, like the one about the inventor who wants to bring to life the self-created doll Coppélia, and by chance a couple in love – Swanilda and Frantz – enters his life. In the original version of the ballet, the freak Coppélius recluses and is mocked in the end by the small-town community. But Giorgio Madia changed the plot, and gives a happy ending to it, and even let the constructor find a girlfriend. So far about the plot. The masterful dancers (great from the beginning Paulina Wos as Swanilda, Lukas Ożga good as Frantz and Michal Halena as Coppélius), whose work on the demanding ballets of Madia (who formerly created “La Fille mal gardée”) always costs a lot of effort, are implementing that especially wonderful effect to surprise the audience. The subtle sense of humor, tricks that are simply amazing, (during the wedding scene we see, that dance cannot only be exposed by leg work). Importantly, all this is accompanied by a huge sense of style, with an opulent, but extremely beautiful scenery by Fabrice Serafino (with motifs referring to Polish lace, because the action takes place in the Polish countryside), and by tasteful costumes by Malgorzata Słoniowska, (especially the soldiers’ uniforms in pastel colors look like doused with icing) complemented the wonderfully imaginative choreography. 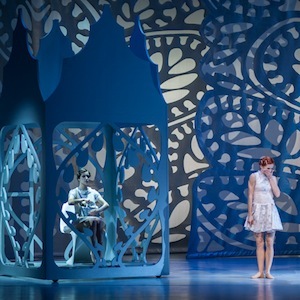 […] A harmonious blend of dance, music, set design and costumes made the ballet entertaining and touching. Exquisite, ethereal costumes, the funny choreography, musical phrases citing Moniuszko, suit the dynamic nature of the spectacle and the great lightness of its comedic vigor. The juxtaposition of strength combined with the delicacy of lace created an interesting effect of stage design, as well as the moving parts of the bodies of dolls in Coppelius’ laboratory; the production looked impressive and with its choreography it surprised many a viewer. The Polish folklore elements contained in the set design, the costumes and the music looked just great. Giorgio Madia said before the premiere, “my goal is not to be interesting, but to be good at what I do”. The performance was warmly received and was the perfect realization of the stage director’s credo. Giorgio Madia’s dramaturgy was explicit, clear and far from coincidental, and the orchestra under the baton of Tadeusz Zathey was clever, sensitive and impressive, so that “Coppélia” had become a wonderful fusion of dance and music.